I am sharing some fun and delicious recipes courtesy of Hillshire Farm. With spring and Easter quickly approaching, it’s great to have a few ideas for warm, easy-to-prepare meals to share with your family and friends. Hillshire Farm Beef Smoked Sausage and Polska Kielbasa are delicious and versatile meal options that are sure to please. We were sent coupons to purchase Hillshire Farm products so I picked up some sausages and their delicious lunch meats. I wanted to try their recipe for a Tex Mex skillet dinner as well as an old recipe we all like here. Make your supper a little Tex-Mex tonight with the Southwest Hardwood Chicken Smoked Sausage Skillet. Sizzle up some Hillshire Farm® Hardwood Chicken Smoked Sausage with sliced zucchini, red and green bell peppers, and black beans. The real kick comes from that half cup of salsa with some chili powder. *I used frozen thawed corn, and frozen peppers and onions, diced up. In heavy skillet, saute carrots and cabbage in butter or oil, until tender, remove from pan, set aside. Add kielbasa and let brown and heat through. Add cooked noodles, carrots and cabbage, gently toss together and serve. 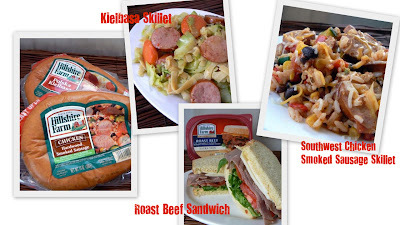 For more Hillshire Farm Recipes and a money saving coupon be sure to visit their site! You've probably seen their catchy commercials, here's one we like and another too. ONE "Mommy? I'm Hungry!" 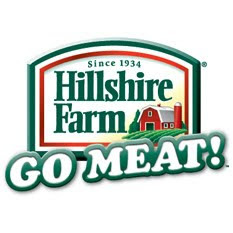 reader will win a year's supply of Hillshire Farm products!! This Giveaway ends: 11:59 pm pst, Thursday, April 8, 2010. I wrote this review for "Mommy? I'm Hungry!" about Hillshire Farm. I received free product coupons to keep for this review. All opinions for this review are that of myself & family. Product info & stock images provided by PR. Hmm... My Polish (well, 50% Polish, but it's the half he likes better) husband would insist on one of the kielbasas, and I'd be down with that, but the cheddar sausage appeals to me the way only meat stuffed with cheese can. Tough call. the hardwood chicken smoked sausage sounds outstanding--that's what i want to try whether i win or not! I'd like to try CheddarWurst :) *Thanks* for the giveaway! I will always have a weak spot for the Beef Polska Kielbasa. MMM, I used to make yummy sandwiches with this and loads of cheese on two slices of buttered white bread. Nothing more dangerous. I have to keep it out of my fridge for fear that my youth will creep up on me. beef hot links sound good to me! I love really spicy sausage in pasta! My favorite still is Polska Kielbasa, though the Lite is coming up fast. Frankly, if I win, there won't be a duplicate -- I'd try a different selection each month. Their quality is unsurpassed. I recently saw the hardwood chicken in the store recently and plan on trying it soon. The summer sausage looks yummy! I would like to try Hillshire Farm® Lite Smoked Sausage. I would love to try the Polska Kielbasa! Oh the hardwood chicken smoke sausage... I love chicken sausage. I'd like to try their Beef Summer Sausage. (email is in my profile). Thanks! I'd like to try the Ultra Thin Hard Salami. Their new Hardwood Chicken Smoked Sausage sounds good; would like to try that. I haven't seen the Miller High Life Beer Brats before and I think we would like those. I would like to try the Polis Kielbasa. Me and the hubs love the beef hot links! We like to put them in the crock pot with bbq sauce and eat them by themselves! I would like to grill the CheddarWurst® Links. I would like to try the Turkey Smoked Sausage "on the grill." Thanks. I would love to try the Hardwood Chicken Smoked Sausage, it looks great! I'd love to try this - Hot & Spicy Italian Style Smoked Sausage. I've tried just about everything they have so I think I'd like to try the Miller High Life Beer Brats! I'd like to try the summer sausage. I would say they all sound good..lol..but to name one I would say the Smoked Sausage. I love sausage with green peppers and onions..yummy.. I would use it on Hot & Spicy Italian Style Smoked Sausage . I would like to try the Polska Kielbasa. Your recipes look delicious!! I like the Smoked Sausage. i think the Ultra thin sliced Sugar Baked Ham lunchmeat sounds yummy for the packed lunches! I'd like to try the Lite Smoked Sausage. BBQed and stuck on a piece of wheat bread with mustard. Nummy!! I'd like to try the Deli Select® Brown Sugar Baked Ham and Deli Select® Premium Hearty Slices Oven Roasted Chicken Breast. We buy a lot of the Polska Kielbasa. It's our favorite! I would like to try the Yard-O-Beef®! Im following you on twitter @wellnessmommie is me! the cheddar wurst ---wish I had some right now! I'm hungry. We do lots of kielbasa and love their little smokies. Mmmmm... we LOVE summer sausage around here! And Hillshire farms definitely makes the best! 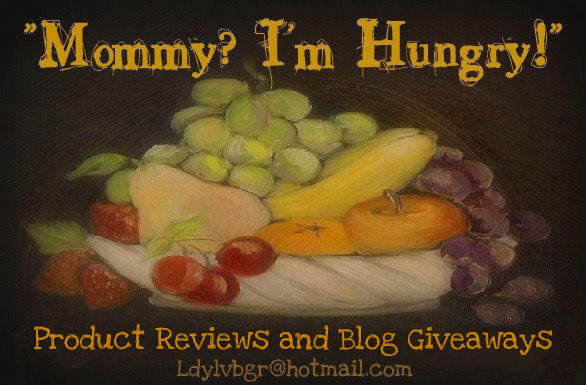 Thanks for a mouth-watering giveaway!